It opened after April Fool's Day but after reading dozens of "alleged" reviews from renowned film critics across the country for Hannah Montana: The Movie, I couldn't help wondering if temporarily their computers had been hacked into by the same individuals who leave nonsensical, inflammatory, and hateful comments all around the internet. By referencing everything from terrorism to brainwashing to torture, some of my journalistic idols took the lowest road imaginable in pieces that could've most likely been classified as shock-jock rants instead of traditional reviews. In trying to rationalize the hate they were no doubt hoping would pass for humor, another thought that entered into my mind was that perhaps there was some sort of unspoken press corp challenge going on about who could create the angriest and most sarcastically extreme paragraphs. Having missed the press screening for the film before its release and being repeatedly told to keep my expectations for the film low, I must admit that given the flood of nasty comments, I wasn't exactly looking forward to checking it out save for the fact that I try to review a diverse selection of titles to keep open-minded and offer something for everyone. Additionally, I have to confess that I'm not a fan of Miley Cyrus nor had I ever seen one second of her internationally successful television series Hannah Montana. Yet while it's a very weak film structurally speaking as contrivances and cliches abound in what would have essentially worked better on the small screen-- contrary to the exaggerations expressed in the frustrated rants I'd read-- watching the film didn't make my head spin around Exorcist style or remind me of waterboarding in the slightest. Overall, it's a colorful confection that's perfectly tailored to its demographic of devoted fans who are crazy about Hannah and likewise one that actually had me from the inventive intro until the middle act and Miley's "Hip Hop Hoedown" brought the film to a screeching halt. In order to quickly hip those of us unfamiliar with the Hannah storyline (as minor as it is) via an engaging opener that's still the most dynamite extended sequence of the entire movie, we see Miley Stewart (Cyrus) and her best friend Lily (Emily Osment) arrive outside the ticket booth of a jam-packed Hannah Montana concert. Given the key line to let us know that Miley and Hannah are one in the same, Lily jokes that her friend is the only pop star she knows who can't get into her own concert after their plea that they're on the list is denied. Coming up with an immediate Plan B, Miley spots a temporarily abandoned security golf cart and the two crash the backstage area to get to the dressing room and Miley's dad Bobby Ray (Billy Ray Cyrus) before the concert fuzz catches up with them. Amusingly driving the cart right into a promotional paper banner that covers Miley's head with Hannah's for an instant, we watch the girls kick her dad out of the room as they transform the typical teenage brunette into the superstar via a blonde wig and an enormous train case filled with cosmetics. After the transition is made, an in-joke hearkens back to a previous Montana song and movie as Miley and her reference her wish to have "the best of both worlds" since she's able to attend school and do chores as Miley but entertain a stadium filled with kids as Hannah. Yet shortly after she hits the stage, the concert segues into the music video playing in the background as Hannah pays homage to Disney teen queen Annette Funicello's beach movies in a slick piece of movie editing. Building up audience expectation and the film's breakneck pacing, it's a stunner of an introduction to the movie that showcases the creativity and energy of those working behind the scenes to give it a high quality polish which makes the languid and overly long second half especially yawn-inducing. No doubt taking a cue from Disney's smash High School Musical works where musical numbers are cut from one location to the next, it's this kind of imagination that instantly finds director Peter Chelsom's Hannah Montana: The Movie surpassing Disney's recently released Jonas Brothers title which felt lifeless and generic by comparison. Unfortunately, Chelsom's film loses the momentum fairly early on when a British tabloid journalist decides to make it his mission to uncover the truth about Hannah in a tell-all expose that would put an end to her double life. Aside from an excruciating shoe fight with Tyra Banks in a brief cameo, the movie benefits considerably from a fun turn by Vanessa Williams-- which should appeal to those who enjoyed her in Ugly Betty-- as Hannah's publicist who encourages the young woman to spend more time engaging in life as a star. However this advice results in not only the aforementioned shoe boutique showdown but also in ruining Lily's birthday party when she's forced by a time-crunch to arrive as Hannah and steals focus from her best friend. 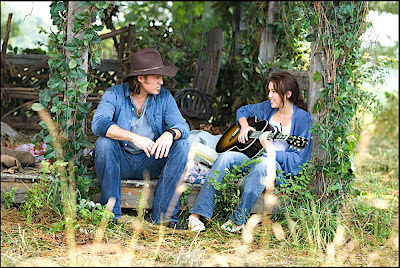 After one too many disappointments has found Miley forgetting what's really important in life and who she truly is, daddy Cyrus (er, Stewart) forces Miley to give Hannah a vacation by bringing her back to her Tennessee roots and life on the farm. Conveniently the location change provides both Miley and Bobby Ray with love interests in the forms of adorable Lucas Till and The Office and 17 Again star Melora Hardin. Yet when inevitably the tabloid reporter hunts her down to Crowley Corners, TN, Lily arrives to help support her as the body double when Miley must again go from blonde to brunette repeatedly until she's forced to either come clean about the dual role or accept which identity means the most to her in the end. Although the last half of the film still looks gorgeous in showcasing the colors of the Tennessee landscape in Disney widescreen Blu-ray, in terms of its screenplay it ditches all of the effort that had come before it in the previous sequences in favor of misunderstandings and stunts that we're usually presented with on the small screen. 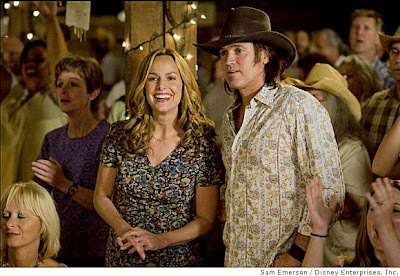 Despite this, the movie is augmented by musical performances by Billy Ray Cyrus, Rascal Flatts, the showstopping Taylor Swift (who similar to The Jonas Brothers Movie, immediately makes you wish she was the artist we were watching) and aside from that regrettable "Hoedown" a few catchy tunes by Miley that sound perfectly balanced with the rest of the dialogue in a solid 7.1 DTS-HD Master Audio English track. While it does best Jonas as a musical comedy, creatively the movie goes to sleep after the opening segment. Thus eventually Hannah pales in comparison to the High School Musical works which-- aside from their thin plot-lines-- managed to hide the flaws with sheer overwhelm in the stylized music numbers that surpassed the horrid Mamma Mia! Moreover, while I won't be watching Hannah Montana: The Movie again since some of Miley's antics beyond the hoedown annoyed to no end especially in the "Go Daddy" chant she starts when she thinks her dad is going to kiss his love interest, it's nonetheless an innocuous movie from start to finish that is nowhere near worthy of the wrath filled rants it provoked. Additionally, while she's not a young Gloria Steinem, she's the opposite of Paris Hilton which is further evidenced in some of the special features included on the Blu-ray as ultimately you realize that Hannah Montana boasts more "believe in yourself girl power" than most movies being marketed to the age group that find females cast as sidekicks, damsels in distress, or mere stereotypes. Released as one of those money-saving combo packs that feature the work in three different formats including Blu-ray, DVD, and a Digital DisneyFile copy for owners to download to one of their compatible PC or Mac portable devices to take with them, the Hannah Montana Blu-ray boasts a cleaner color transfer than the overly "blue" tones noticed on the recent Race to Witch Mountain Blu-ray along with BD-Live extras, music videos, bloopers, deleted scenes and a few featurettes including two that were preferable to the film from an adult's perspective. In "I Should Have Gone to Film School," co-star Jason Earles interviews the many individuals working on the set to educate viewers about the hundreds of people who make a film possible and in a terrific featurette, Miley, Billy Ray and Emily lead you on a tour of beloved spots in their hometowns in the thematic tie-in extra "Find Your Way Back Home," which is an informative, entertaining and revealing exploration of locales in Tennessee and California you wouldn't typically see in a film like Hannah. Ideally suited for its intended audience-- while there are many things wrong with Hannah Montana as a film, in my eyes, there are far more flaws to be found when those who have excelled in the realm of film criticism lower themselves to playground level insults in rants unworthy of both the writers or their loyal readers. And this is especially the case when, instead of speaking out against something truly prejudicial or offensive to humanity at large, they're pouring far too much energy in annihilating a G-rated movie for young girls in an industry where females are not only the most under-served demographic for studios but are also extremely under-represented in the field of film criticism. Now maybe it's me but it kind of makes one wonder what the true source of their anger really is since rationally, this benign film can't logically be the cause of it... even when Miley is encouraging us to "polka dot it" in that awful "Hip Hop Hoedown."